In the U.S., 33,000 farms with under $100,000 annual income have disappeared during the seven years of NAFTA. This is a rate six times steeper than the pre-NAFTA period. In the U.S., farm income is projected to decline 9% between 2000 and 2001 -- from $45.4 billion to $41.3 billion in 2001. This compares to annual farm income of $59 billion before NAFTA went into effect in 1993 -- a 43% drop compared to the 2001 farm income projected by the Farm and Agriculture Policy Research Institute. NAFTA-required changes have resulted in literally millions of Mexican peasant farmers leaving their small farms and their livelihoods and being forced to migrate. The land redistribution program established in the Mexican Constitution at the time of the Mexican Revolution was changed to meet NAFTA's foreign investor protection requirements-- meaning that, for the first time in 80 years small farmers could lose their land to bad debt. Projections range up to 15 million displaced Mexican small farmers because of NAFTA's agriculture provisions. While Canada's NAFTA agricultural exports grew by C$6 billion between 1993 and 1999, net farm income declined by C$600 million over the same period instead of rising by $1.4 billion as Agri-Food Canada had predicted. Since NAFTA, the rate of Canadian farm bankruptcies and delinquent loans is five times that before NAFTA, even as Canadian agricultural exports doubled. 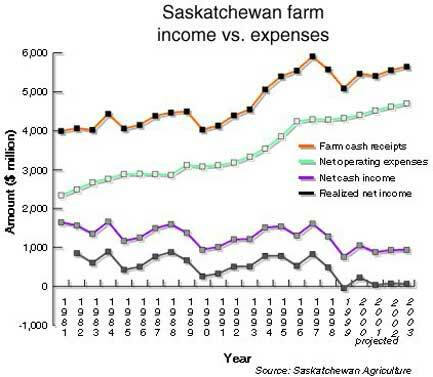 Dropping prices meant that in Canada, farmers' net incomes declined 19% between 1989 and 1999, although Canadian agricultural exports doubled during that period. Many agribusiness concerns operating in North America took advantage of the new rights of market access for agricultural products and NAFTA's new investor protections and began rapid consolidation. Agribusiness mega-mergers like the unions of Smithfield Foods and Murphy Family Farms, or top poultry producer Tyson Foods with meat packer IBP, have become a feature of the NAFTA era. Agribusinesses have been able to create new export platforms which play farmers from the U.S., Mexico and Canada against one another in a fight for survival as prices paid to producers are steadily pushed down. While the number of independent farmers dropped between 1993 and 2000, agribusiness giants such as ConAgra and Archer Daniels Midland had significant earnings gains. From 1993 to 2000, ConAgra's profits grew 189% from $143 million to $413 million; and Archer Daniels Midland's profits nearly tripled between 1993 and 2000 from $110 million to $301 million. NAFTA contains a chapter establishing intellectual property rights that require the three countries to issue patents guaranteeing 20-year monopoly marketing rights on a vast array of items, including seeds and plant varieties. 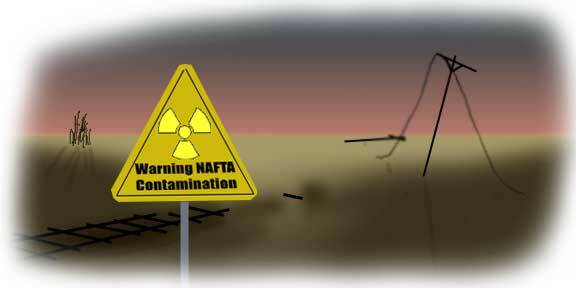 It also required Mexico to change its domestic law and institute criminal penalties for violating these NAFTA rules. These vast new intellectual property rights have established yet another way for U.S. and Canadian agribusinesses to benefit from NAFTA: biopiracy. Indigenous communities that have been planting and crossbreeding strains of food crops for centuries to develop perfectly adapted varieties can be required, under NAFTA, to pay an annual license fee to use their own saved seeds if a corporate bio-prospector has collected the seeds and patented them. The report documents several specific cases that have arisen in recent years.